This article is based on personal observations over the last 5 years. I have not checked with the various officials which may have had the authority over the events that were observed. The geographical area that has been observed is North Perry Airport in Pembroke Pines. The airport is used by small airplanes and helicopters. It has many hangers for the planes and their repairs. It also contains Maxwell and North Perry Parks. The northeast corner of Perry Airport is home to Broward College-South Campus. A small fire station is just south of the college. When there were special events at Joe Robbie Stadium (now Hard Rock Stadium) one could see a blimp parked in the open grassy field, once part of a dairy. My family and I lived in the area east of North Perry Airport since the late 1970’s. Our kids played sports at the two parks, and we availed ourselves of many programs at the college. I did my marathon training on a pathway around the campus lake. In recent years I kept in shape by bicycling. Most of the route took me around the airport and parts of the college’s campus. I discovered the many burrowing owls that had their homes on campus and the airport. Every year they would come back to their burrows and start their new families. Due to the increase in owl population new burrows were dug. In most cases they would stand outside of their burrows or perch themselves on the airport fence. 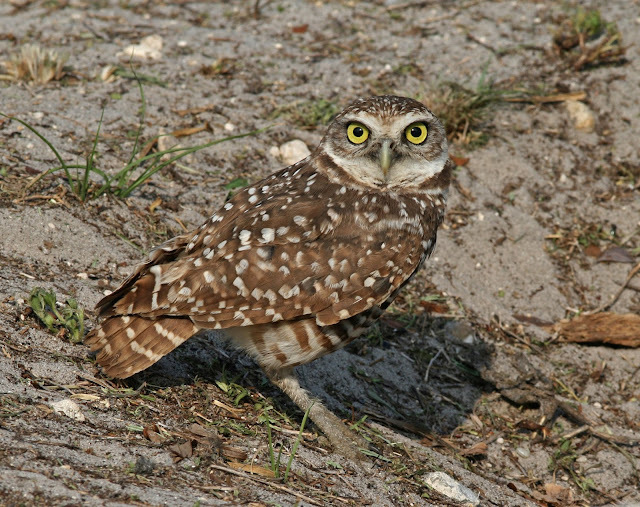 The young owls could be seen around April. One particular nest was the top producer, having two or three little ones a year. The most owl that I would see during one bike ride was 17. A nest on campus had a little perch that someone built near the burrow. From time to time you could see an owl on it. During this same time I started seeing foxes. They were mostly on the campus but every so often you could see them on the grassy areas of the airport. At night after students left campus you could see up to 12 foxes. On one bike ride I saw a fox digging up a burrow. I can imagine what the fox was after. This spelled trouble for the owls. But soon there would be even greater threats to both the owl and the foxes: man. The airport added a new airplane hangar on one owl nest while Broward College built a maintenance area over the nest with the little perch. Last year, the airport re-paved its runways. In order to do this, a dirt road was built to access them, destroying two more nests. During this same phase of building, rock was put under the perimeter fence, covering four more nests. One of them was home to the prolific owls. During my bike rides this year there are no foxes or burrowing owls…not one left. As an exclamation point last week as I biked around the perimeter road I notices that at least 3 new signs were erected stating that land was available for DEVELOPMENT! One can speculate what happened to the owls and foxes but all I know is that I will not be able to show my grandchildren those pretty little creatures. Again, I did no investigative reporting, I just shared my observations. I can understand why a fox may dig up a burrowing owl’s home, that is their survival. I cannot understand why man destroyed many of the nests. It was not for their survival!